No one minds fair competition. Unfair competition — well, that’s different. 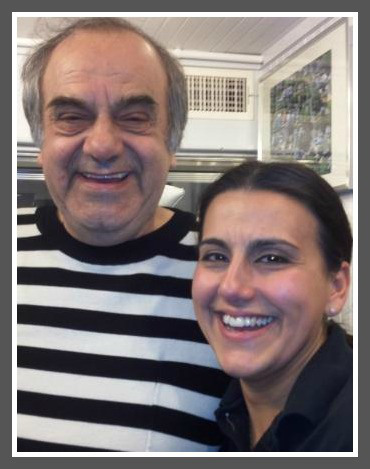 Nick Yiozanakos and Niki Boulas, Elvira’s owners. In February, Niki Boulas — owner of Elvira’s Deli near Old Mill Beach — emailed the first selectman’s office. She said that after Hurricane Sandy, there’s been lots of construction in the area. Recently, she noticed a big impact from food trucks. She wondered what could be done. All food trucks are required to have a health permit. Food trucks that park on town-owned property are also required to obtain a town vendor’s permit. However food trucks on private property are not required to obtain a town permit (just a health permit). There are no local zoning laws regulating food trucks. Therefore if the food trucks you mention are located on private property construction sites, the town does not have any jurisdiction to ban them from operation. The food permit costs $10. There is an additional fee of $25 for each vehicle used. Vendors are not allowed to compete directly with established retail operations anywhere in the Town of Westport. For example, ice cream vendors may not operate in the main business areas of Westport or in close proximity to outlying stores which sell ice cream. As many of you are aware, there have been many food trucks coming into our area from out of town. These trucks have had a significant negative impact on our business. Their fees to the town are minimal. There is no way for Elvira’s, as a small mom and pop business, to compete with their prices as our overhead costs are greater, and we are a Westport taxpayer. For over a month now we have been dealing with town officials and our First Selectman, and we have gotten nowhere. As a local business serving the community for the last 16 years, we find this situation to be unfair. Now we need your help by signing our petition to ban or restrict them from our Compo Beach area. Thank you! 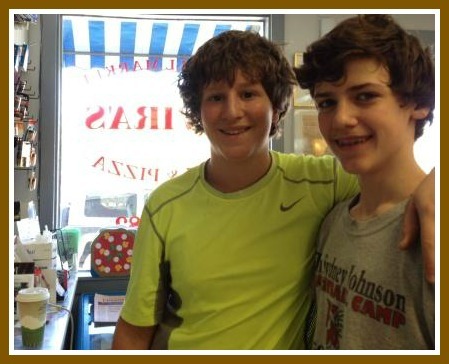 Bedford 8th graders Bryce Reiner and Billy Hutchison are big — and loyal — Elvira’s customers. As of yesterday afternoon — despite 98% of Westport being away for school vacation — nearly 200 customers had signed. The names included some heavy hitters in town. Elvira’s has many fans. It’s been an anchor of the Old Mill community — during Hurricane Sandy, sure, but before as well. And long before the invasion of the (perhaps illegal) food trucks. This entry was posted in Beach, Local business, Local politics, People, Weather and tagged Elvira's, food trucks, Gordon Joseloff, Hurricane Sandy, Niki Boulas. Bookmark the permalink. I think they do protesteth too much. Those workers do not wish to take time from their job sites. The convenience of having the food brought to them outways leaving, getting in a car, parking, ordering/getting the food, paying and heading back. Maybe Elvira’s should offer delivery or pack a car with food stuffs and go to the sites. I think they missed an opportunity and now desire the town and the residents to legislate in their favor. While a local place is great, in the winter months Elvira’s goes into hibernation by closing at or before 4:00 PM (people don’t eat after that?). Their holiday vacations are almost longer than the school systems. I wish I could take off that much. They no longer sell beer or lottery tickets. I appreciate their location and service but they have the solutions in their own hands. In America we innovate to compete – or we close. I thought this was America….the land of Free Enterprise? In response to Elaine M and those concerned about the food trucks parking illegally..the Deli has customers and vendors that park illegally. Trucks pull up on the sidewalk (over the curb and in front of the Hillspoint STOP sign) in front of their store. And now Deli customers are even parking on Compo Hill in front of that STOP sign (and beyond the “no parking” sign) where the town spent taxpayer dollars to remove the trees last year to increase visibility. I guess as long as these are customers and they are spending money at the Deli , then parking illegally like THAT is OK. Talk about dangerous and illegal…have you ever had to pass the Coca Cola delivery truck while it idles on Hillspoint road in front of the Deli, in front of the stop sign at Compo Hill and Hillspoint, while someone is trying to make a blind left turn onto Hillspoint Rd from Compo?? Pretty dangerous… but since the Coca Cola truck is providing a service to the Deli and illegally parked customers are buying something..then the Deli does not see fit to complain about these violations. The Deli is only complaining about the violations that don’t serve their business well. Is this blog post a complete joke? Please, tell me you’re just late on the April Fool’s Day post. I mean… GOOD LORD, what is this world coming to??? And people wonder why so many nut jobs are afraid of our government. As delusional as they are, this immediate desire to make “big brother” step in is pathetic, sickening, and downright childish. There is no legitimate evidence to back the claim that they’re breaking any town laws and with regard to competition… Ummm, that’s how the free market works. If construction workers want your food, they’ll bypass the food truck and walk (or drive) to your store. It’s really THAT simple. These people are trying to use some obscure town ordinance to squelch legitimate — and completely fair — competition. That’s not really how the free market works. It amazes me that a Mom and Pop shop cannot understand the basic concept of supply & demand, free market capitalism, and so on. This is exactly why America is in the mess it is. Because “big brother” always steps in and as shown pretty regularly (including yesterday’s senate vote), “big brother” is broken and incapable of fixing. Furthermore, there is nothing to stop or fix or ban. These food trucks are providing an essential service to the construction workers; they’re bringing food TO the sites. Is Elvira’s offering this? Is Elvira’s willing to invest in a delivery car or perhaps preparing meals in advance to sell at the sites? You cannot expect or FORCE the workers to come to you. Many of them are driven to the sites and dropped off, and others simply do not have the time or ability to drive their cars over to your establishment. I implore the owners of Elvira’s to step back and reevaluate the situation before your unjustified crusade on the basic concept of the free market gets too far out of hand. Shame on you. I support Elvira’s POV — they pay taxes, they are a part of our community, they provide refreshments, shelter and a social destination for area kids, as well as visitors to the beach… and they will be here long after the food trucks are gone (with the completion of the construction). The food trucks offer minimal to zero benefit to me and other members of the community — and provide zero benefit to the tax base. They are opportunists — here for the “feeding frenzy,” (pun intended) with all the new construction going on and once that fizzles, they will vanish as quickly as they came. Meanwhile, Elvira’s has hung in: through bad storms, the bad economy, tax increases. Which is why the town instituted the regulations — but unfortunately, the language is too vague to make it enforceable, and subject to interpretation. Your loyalty or support of Elvira’s, as a local resident, is all well and good. But the construction workers who have to pay for the food and/or travel to one place to get the food are not local residents. Perhaps the contractors (doubtful) or architects (likely) are, but not the actual men. You cannot expect to hold them to that standard. They’ll choose whatever is most affordable and whatever provides the easiest access, such as a truck that brings the food to them. Many of these men do not have the ability to travel somewhere just to pick up food. Since when is Westport Music fighting to stay alive? They teach hundreds of kids each week, rent instruments and sell music to the hundreds of students. I guess I should stop being amazed by some of the comments by anonymous individuals on this blog but I can’t get over the fact that people who claim to embrace the free enterprise system are so critical of a small hard-working family business which epitomizes capitalism. First of all, I would be willing to bet that the individuals posting above would be up in arms if their next-door residential neighbors decided to look to increase the value of their property by building a multi-unit condo high-rise or an office building. But, of course, the neighbors can’t do that due to government zoning laws and regulations. So it would seem the anonymous people posting here, if they own property in Westport, are quite willing to accept a significant form of government regulation to benefit themselves and ensure an orderly operation of the “free market” residential and commercial property system in town. If they own residential property in town, these anonymous posters in all likelihood don’t like to see their property taxes escalate. Well, one way of keeping those property taxes at reasonable levels is to have a thriving commercial tax base with local businesses such as Elvira’s. Would these individuals suggest that anyone should be able to set up vendor carts anywhere on Main Street to sell whatever wares they want and that the local stores should learn how to compete with them if they want to stay in business? Again, I don’t think so. I can’t say I personally know any capitalists who are opposed to reasonable regulations in the marketplace. And I think Elvira’s is raising a legitimate point. See my post above. You’re misguided and looking at a completely different aspect of the issue, rather than the core of it. Also, in the interest of full disclosure, I frequently patronize Elvira’s, but that has no impact on my general point of view articulated in my prior post. As a contractor I recognize the need for food truck deliveries to the site as accurately stated by Fair Market. Today, independent owners need to be innovative and creative. Elvira’s is a Westport Institution for people down by the beach… But the thought that government needs to stranglehold free market enterprise is crazy. Government has a hard enough time managing it’s own affairs let alone policing the private sector. The owners of Elvira’s seem like nice people…but businesses must adapt to remain competitive. A simple visit to the construction sites a stone throw from Elvira’s by Niki with that smile and some great food option’s, that are clearly better than what the “roach coaches” carry onboard, would seem like a much better solution than trying to get our town government to enforce a regulation that you can drive a food truck through. Amen. Thanks for speaking the truth without anonymity, Jamie. I wish I could, too. Bravo! As the owner of a similar store in the northern part of town, I clearly understand Niki’s frustration and concern. But I don’t think this is an issue of increasing regulation or utilizing town resources to enforce same. I think its simply a matter of a service appealing to a particular segment of the food market, one that is temporary. In the past, I too have seen my share of VERY large construction projects go on and watch the “roach coaches” scurry in and out throughout the day. These mobile delivery trucks, in general, provide a lower cost, lower quality product which appeals to a lower paid segment of the construction crews. Most of them let the workers run a tab till they get paid at the end of the week. I’ve learned that the higher paid trades will travel for better food (when I ask, many comment that they would not eat that food or drink that coffee). So, I think Jamie above says it best, Niki, stick with your wonderful service and great products and you will attract those that enjoy Evira’s superior food . As others suggest, there are guys onsite who do not have transportation or can’t take the time to go out for food. The cheapest, easiest solution is to send one of the staff over every so often with a menu and your specials and encourage them to call in an order. The other thing is to adapt your menu, run a cheap alternative such as rice & beans, chicken or pork every day and you might find the guys will show up. Just a thought…. If the food trucks have has a “significant negative impact”, then they must be drawing normal business away from Elvira’s and in violation of the town’s stated policies. Moreover, as noted, they are parked on the town’s right of way. I would recommend that Elvira’s file a complaint with the P&Z dept. as the first step. A lawyer (any volunteers?) will be needed, too. Since you’re not a lawyer, I would suggest you pipe down. I know the rules and regulations… An attempt to ban the food trucks would not hold up in any kind of reasonable court of law solely based on the regulation as currently written. Even if they did try to enforce it, the food truck would simply find a way to move onto the private property. And then you have just wasted valuable time, taxpayer dollars, and much more on basically whining like a baby and trying to get Big Brother to help you. If you’re such a “Freedom Fighter” why do you not use your real name? What does a pseudonym have to do with fighting for freedom and citizen’s rights? You’re spending your time telling people to pipe down etc… You might have some valid arguments but your hostile attitude, coupled with your ridiculous pseudonym, destroys your credibility. Harumph. I strongly disagree and believe that the “hostile attitude” is what you perceive, not what is true. Stop asking Government to fix everything for you. LOCAL ICE CREAM TRUCK: Please take note. When I called you a couple of years ago to bring ice cream to a private party at my house on a private road you told me you couldn’t sell anywhere south of 95 on Compo Road. Apparently you can sell on private property. Sadly for Elvira’s, bringing this issue to light may bring more food trucks. The best the town can do is make sure that the food trucks are parked on private property and not the road where they impede traffic. Elvira’s should deliver their menu’s to the work sites and take orders for lunch delivery and hopefully share in the local rebuilding boom. I don’t understand “significant negative impact on our business.” Are regular Westport residents etc. patronizing the food trucks instead of Elvira’s? I find that doubtful. They aren’t losing business they just aren’t capitalizing on the short-term effects of Sandy. And as others have pointed out if they wanted to maximize a temporary gain – they should change their business model a bit to be competitive rather than banning others. ZIAC – you hit the nail on the head. As long as the food trucks park on private property, no harm no foul. so next time i am in nyc and it is raining i should not buy my umbrella from a street vendor but rather go out of my way to find an established store that sells umbrellas? i moved here from europe to escape protectionism and embrace free enterprise. competition is healthy people – for everyone! Many “free enterprisers” are the first to complain when it’s in their backyard…or neighborhood. Sensible regulations equitably enforced help everyone. What regulations would they like changed? See above response to your first comment. Elvira’s is being very smart. They are trying to limit competition. Every smart, successful small, large business owner attempts to do that. They are going about it as anyone else trying to protect their revenue stream would. Disagree or agree with the change or interpretation to regulation that they are proposing but don’t criticize normal business strategy. Then they would also understand that competition is normal and, more so, expected. ZIAC makes a great point, actually. It’s not really competition or a loss of revenue/business/etc. if they never had that business in the first place. As stated several times before, these workers the food trucks service would not suddenly switch to Elvira’s if they couldn’t buy food from the food trucks. They would probably just pack their food and bring it with them. Most of these workers do not have the ability to drive to a store or have the time to walk down to the store or have the money to pay for the higher priced food. I don’t necessarily disagree with you I just think that getting regulations changed, passed, revoked is part of that capitalist-competitive process. Any business that ignores that angle is letting out too much rope. Hmmm you make a good point. Its just tiresome when often the first (and seemingly only) reaction is legal – lawsuit, proposed new laws, fines etc. What if Elvira’s is successful? Then what? The workers who maybe can’t afford, walk/drive, stomach the food at Elvira’s are just out of luck? Or should we start a law to ban them from brown bagging it too? This whole thing would be more palatable if it was part of a multi-pronged strategy that included a worker’s special (rice & beans etc.) or offering delivery that others have suggested. Or a 5pm quitting time beer? I would stop by for that too…..
A ‘rice and beans and beer workers special’. That is really stereotyping in a way that makes me cringe. No wonder my relative hid their Spanish roots. I wish there was a petition supporting the laborers the freedom of choice for their lunch. I mean, this is ridiculous. These guys get a short break for lunch, and they just don’t have the time. The food truck is way more convenient. How many Westporters in the very pricey beach area are taking their business to the food truck? Completely agree with ZIAC and Fair Market. The trucks are here specifically for the workers. Come on Elvira’s, someone who lives in a 3 million dollar home down in that area, and the person who is on the building crew for said home, are two different customers. Even if the food trucks were banned, doesn’t mean they would suddenly be an Elvira’s customer. Maybe Elvira’s should put a “workman’s” special on the menu- I love Elvira’s but it is a bit pricey! . This may hit the nail on the head WRT the downturn of biz at Elvira’s. Shortened hours, limited selection (I won’t get into a quality discussion, but suffice it to say nothing there appeals to me, and I live within walking distance), no draws such as beer, etc. and pricing. Biz 101 says if you charge too much, customers will go elsewhere. Mr. Cantor, are there quantifiable stats to support your thesis that the trucks are taking away from their business or did Dan Woog happen to listen to the comments? I’m ok with DW’s post, it’s what makes the blog good to read and worthy of contributions. FM–it’s not my thesis; it’s what I have heard from the staff at Elvira’s. I doubt they have quantifiable stats. But I too have seen the food trucks selling on the side of the road of construction sites–and I wonder, in a general cost-benefit analysis, what ultimate benefit they provide to the town, especially if they are detracting from the business of locally-based stores. As other’s have pointed out they may or may not be a cause in traffic to the deli. But if it was my store, you can bet I’d handout some flyers at the sites. FWIW, we have had some mason work done for the past few days. They came out of “the valley (Naugatuck).” They brought their own lunches. It is cheaper and easier. The deli might want to account for the fact for the lower economic workers, between gas, and other expenses it is cheaper to bring food and drink from home. The food trucks are addressing convenience. No they are not haute cuisine, but they fill a need. It appears that a few of them are based out of Bridgeport, a city who’s been in the financial doldrums these days and can use a tax increase in their base (perhaps more than Westport). Fred, your argument still makes no sense. You’re insisting that we shut down legitimate operations providing both a convenience and necessity to others who are employed by many Westport businesses that pay taxes, and those businesses are owned by individuals residing in Westport who pay more taxes because they are more successful because their employees can utilize the food trucks. See what I’m getting at??? This whole holier-than-thou “how does it benefit the community” is absurd. If you applied this theory to everything, you wouldn’t be able to live your life. People working here in town benefits the community — who cares what they eat or how they choose to do it? It’s a free world. Move on. I find it fascinating that various commenters here are so quick to dismiss Elvira’s assessment of the proliferation of food trucks on their business. Elvira’s staff have noticed a clear drop-off in their food business from laborers who work on home projects in the area. I don’t understand why some people are so ready to minimize or overlook that. And that drop-off is apparently coming as a result of food truck businesses that seem to do virtually nothing for Westport’s tax base–and are having an adverse impact on a commercial property that does contribute to Westport’s tax base. Why is that not a legitimate issue for people to consider and potentially reassess, especially when zoning and local property taxes are such a critical components of Westport’s essence? And it’s interesting that Iron Lady brought up NYC, which has a large enough population and business base (including an enormous number of tourists) to support-street vendor businesses. Even with that situation, there are a variety of rules limiting where those vendors can sell–and limits on the number of general vendors. Fred, give it up. If your only argument is about taxes, you’ve got a long row to hoe. Ff–I have to go, but if you read what I have written, it’s not solely about taxes (although that alone should make for compelling reasons to look at this more closely). Per your argument, people should only use westport contractors that live and employ people from Westport in addition to they should only buy their material from Westport supply yards. Last I checked, that is not realisticly feasible. Workers do not have time to leave work and trek even just down the street to grab a meal, eat it and enjoy some sort of break. The roach coaches should be the least of their worries. They are fighting for customers that are not in their typical customer base. Does anyone happen to know (perhaps Mr. Walsh, as he likely has experience with them) how these trucks operate? Is it as random as just driving around looking for job sites? Or, are they informed/called by the workers to a specific site? If its the later, seems to me they are simply providing a requested service from a loyal customer base. And, if that is the case, wouldn’t any action by the town to impede their business at Elvira’s request be illegal, if not just a little underhanded? If its totally random, then forget everything i just wrote….. The trucks can check town building permits for new work locations or get called by contractors. They don’t drive around aimlessly looking for construction sites. Did Mr Krabs complain when Sheldon J Plankton opened up the Chum Bucket to compete with his Krusty Krab restaurant? No, instead he pulled up his sleeves and rejigged his menu to include the famous Krabby Patty, Coral Bits and Kelp Rings. Rather than complain you should compete. May the best shark win. Does this mean Elvira’s also complains if someone who lives near them orders pizza delivery from a restaurant in Norwalk? This is a very slippery slope they are on. GOOD ONE !!!! Maybe Joey’s by the Shore should tell the Selectmen that the DELI is in violation of outdoor dining statutes and parking statutes…(which they are) and that by violating those statutues the DELI is unfairly taking business away from JOEY’s !!!! It is a very slippery slope..
Several years ago, Elvira’s claimed it was going out of business and received funds from local supporters to help it remain in business. It seems to me that Elvira’s is looking for a similar hand out from the town government to maximize profits. At some point, if you can’t make it without help, so be it. I’m starting a food truck business, called, “Big Bucket O chum”, I agree with Sandy Cheeks, move on already…. Perhaps I am not making part of my position clear enough. The food truck shown in the picture above, as well as ones I have seen on occasion, are parked on and doing their business on what has to be deemed public property. So, yes, I take that into consideration in a significant way in evaluating the big picture with respect to the impact on tax-paying businesses in town, and what zoning does and does not permit. The current town regs seem to prohibit the activity depicted in the photo, although it appears the regs are not being enforced. I feel they should be enforced and that there is a valid legal basis for doing so. As far as the response that the food truck can just move onto somone’s private property and circumvent the reg easily, well, from what I have seen, that’s not always the case, as evidenced by the construction-related vehicles parked on the side of the road of some of the bigger projects I’ve witnessed. There’s just not always enough room on the private property, and that’s why some of these food trucks operate on the side of the road and become, in essence, the equivalent of street vendors. With all due respect, perhaps there should be more concern about the other construction vehicles and cars parked in the road and on the sidewalk on the other side of the road than a food truck that spends maybe 10 minutes inside or in that location. And in the bigger picture, I think the Westport PD has *slightly* more important issues to address on a daily basis. Talk about wasting our tax dollars (SMH). FM–I wholeheartedly agree with you re there being a separate issue re the parking on both sides of the road at that site that raises traffic/safety issues (and I wonder why that was allowed). But I disagree on what would be involved in issuing a citation in connection with the street vendor issue (which I think would be done by P & Z), and whether that would be a valid use of their resources. But reasonable minds can reasonably disagree, and I fully accept that. that food truck has been in my driveway! I just called my contractor and he said the workers at my house, mostly from Brazil, speaking Portuguese, asked him to call the food truck man to stop by the work site for both breakfast and lunch. The workers pay a VERY little amount of cash for a lot of food that fills their bellies, however, from my contractors point of view, this is not nutritious food, just food that taste good and fills them up. My contractor said most of the workers who use the food truck enjoy speaking Portuguese to the young lady who helps serve at the food truck. Well, there is the answer. Even if there is some enforcement action, the trucks will pull into the driveway (private property where it appears to be legal), and sell their food because they provide a better customer experience at a better price. Sounds like these aren’t Elvira’s customers anyway and any traffic from these temporary customers would be a windfall. Temporary customers, by the way, who apparently would be being gouged by a “monopoly provider” unless they brought their own lunches (likely). God forbid they have a few dollars more in their pockets at the end of the week to provide food for their families. Unless your contractor is hiring child labor the adults he/she has hired can probably make meal choices without anyone else’s advice. Good for Elvira’s for protecting their turf, and good for the food trucks for providing some competition. What would Ken Montgomery say?? We called them “roach coaches” down south. From my experience, the construction guys eat from them at their breaks in the morning/afternoon and go off to Christie’s/Calise’s/Elvira’s for lunch. Not sure what all the hoopla is about? Someone trying to make a buck? Lord, this is Westport for heavens sake. The MECCA OF MONEY MANIA. Apparently Elvira’s is just flushing the money down the toilet. This is the second time in a few years that they’re crying out for help. That’s two strikes. They are a private, for-profit business for a reason. Step up and deal with this self-perceived “competition.” It’s time for everyone to move on. Shame on Dan for putting this up. Realizing upside potential (or thwarting losses) via legislation/regulations is hardly a cry for help. It is a very strong strategy that too many small businesses don’t make use of. Don’t chide them for being smart. I hope they give it a great effort and that at least the food trucks are taxed in a way that makes more sense given their greater presence in the area if the food trucks aren’t already appropriately taxed. Why shame on Dan? It’s his blog to post his pov too – it’s his time and money. This blog’s pov sometimes, at least it seems to me, is to preserve some of what made/makes Westport “unique, special, magical…” add more if you want and that includes the “institutions” that make Westport a very memorable place — not a cookie cutter town. Let’s see, Chico’s, Best Buy, Anthropology, Coach and so forth — what do they contribute to making any town great? Not a darn thing in my book. No one’s going to be writing about them 40 years from now. What does Coffee An, Merritt Superette, Elvira’s, Art’s Deli, Three Bears, Arrow, Sally’s, Black Duck, Peter’s Bridge, Jockey Club, Selective Eye, Klein’s, Ice Cream Parlor ( I realize I’m showing my time in my love affair with Westport) and on and on – they are the places of great value to Westport and make people write about them 40 years later and make/made Westport great — not only for the goods and services they provide(d) but the people that run/ran them and how they contribute(d) to the good town’s people’s lives. It’s called loyalty and there’s much that can be taken to the bank for loyalty too. Fair market aside — not that I disagree with those principles either but Dan’s blog seems to me to try and preserve some of what makes Westport unforgettable. I doubt those food trucks will contribute to that. Long forgotten after the project is done and why would you want to lose a town gem? Another pov. You know it is possible to appreciate the concept of loyalty, love the town of Westport, and respect the very basics of free market capitalism all at the same time. Right? I am shocked all of you are even giving this much attention or credence. It’s really simple… Elvira’s was not getting this business in the first place. But now, because they take a picture of a food truck parked on Hillspoint, they feel they can use it to somehow shut out this imaginary competition. Ok. Sure. Go for it. But it doesn’t matter, because those same trucks will be back next week — this time parked on the private property itself. Done and done. All of these comments, arguments, and so on (especially from Maggie May) are a moot point. Well said, Maggie May — in every respect ! but don’t admonish Dan for expressing his POV. As has been pointed out many times in the past, we are invited – and permitted – to Comment here on 06880, through the good graces of Dan. Elviras is not a long-standing Westport business on par with the others you name. Anyone who grew up in Westport knows that the spot was Grub’s for years and years. And just because an establishment has been in business for years does not necessarily make it the best. The ice cream parlor was wonderful, but when I wanted a pint of ice cream, I would go to the supermarket. Elviras serves a purpose for those in the area. It is not necessarily the best at what it provides. And it is not necessarily entitled to stay in business just because it is a mom and pop store. ^^^ THIS. Maggie May — please read above. Straight to the point. I’ve stopped in to Elvira’s during our summer visits. I’m certainly not stating it’s “the best.” I like the atmosphere. They do seem to provide a lot of community care and support from what I can gather, hence my term “town gem.” If I’m mistaken on that, well fine but I’m sure there are people who would defend that as well. What I was most defending is Dan’s right to present his pov on his own blog — he spends an enormous amount of time and his own money no doubt to provide Wesporters and ex-Wesporters like myself the latest and he doesn’t pretend to be neutral in many cases and where is the shame in that? If you read my initial question, that’s what I’m most addressing — why “shame on Dan?” Whether Elvira’s feels entitled?? — only you all would know that now. So perhaps you enlighten me on that part of this story. I wonder if there are more Westporters who feel that way and perhaps there’s a back story there that I simply would not be aware of. So let’s hear. I always thought Merritt Superette (forget what it’s called now) was a little dingy, dusty and overpriced but boy did I love my daily trips in there as a kid. So… was it the best town general store? Maybe not, but unforgettable and filled with heart? You bet. reporting on news is one thing…looking for reactions is what any blog is all about. Hopefully this “news” story was not written to back someone’s claim (the Deli’s ) that they are disadvantaged because of someone else’s actions (the truck vendors without permits)… Confusing a blog with “real” news is a dangerous direction. If the public starts to look at a blog as a vetted news source that presents all points of view…well , then …”Houston, we have a problem”. One better do their own research before believing. Ask “do all the truck vendors NOT have permits..who vetted that ? ?” ..”Is the Deli in full compliance with zoning laws themselves?? who vetted that? ” Using this blog as a news source for verified information is a VERY slippery slope.. welcome to the 21st century form of un-informed, incomplete ” journalism ” !!!! ….You should probably start by following your own advice. Don’t be a hypocrite. I don’t see Elvira’s as feeling entitled. In fact, it seems that because they don’t feel and know that they are not entitled that is the reason they went to the trouble of posting a petition, pursuing clarification or change in regulations. For the food trucks though as someone else noted they just need to park on private property when serving and then they should not have problem with regulation. Ken Montgomery would have figured out a way to sell the food trucks their supplies or let the air out of their tires! If a free market economy should reign above all, then we should expect to see licensed food trucks parking in the Compo Beach parking lots this summer, selling burgers, hot dogs and ice cream for half the price of Joey’s menu, right? 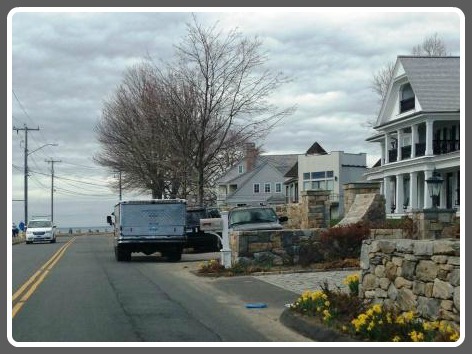 Granted, Compo Beach is town property, but if we are going to allow a food truck to obstruct traffic on Hillspoint Road, wouldn’t it be better if it were safely parked within one of the beach parking lots? Fortunately for Joey’s, the beach parking attendants prevent these licensed food trucks from entering the lots. Sadly for Elvira’s, they don’t have “enforcers” like Joey’s does. And with respect to the person who said that many of the construction workers typically can’t afford Elvira’s menu or can’t get there during their short lunch breaks (I agree), therefore society owes it to these workers to allow the illegal operation of a low-cost food truck (I disagree), what about the fact that these workers could bring their own low-cost meals to the job site? Are you saying that their only means to procure food while at a job site is from a food truck?. Elvira’s has every right to bring this issue to our attention since Town Hall has not addressed their complaint. I’ll gladly sign their petition. You say the food truck is an illegal operation. Do you know this for a fact? Other than the parking violation, what is illegal? Much ado about nothing. When the story about Great Cakes doing poorly came out, Westporters rallied to help. I go there to buy coffee and cupcakes we don’t really need, to try to do my part to keep them in business. I love small business. Trying to get rid of an even smaller business through legal tactics may be really smart as an earlier commenter noted, but it also has consequences. It doesn’t make me want to visit Elvira’s anytime soon. In a free market economy no license would be required to sell food. Not even for health reasons? Yes. A license is merely a barrier to entry. If a vendor sells food that is “unhealthy” he won’t get repeat business; he will go out of business. Tell that do the dead and ill he/she leaves behind….even Adam Smith would take exception to your position. No he would not. Why would you trust the government to do a good job regulating food quality? The government has absolutely no incentive to do the job well. What are the consequences if it does not? None. I said that a food truck parked on public street in Westport would be illegal, as the food truck depicted in the photo, and that a food truck parked in the Compo parking lot would also be illegal (also presumably safer than one obstructing a public street). Town regulations allow food trucks on private property, within certain guidelines. I am not talking about the food trucks that obey the rules, – I am talking about the violators. I am happy that you support small business, as I do, but I prefer to support only those that operate legally in Westport. You used the phrase “illegal operation”. It could be a completely legitimate business for all we know, running a completely legal operation. It is occasionally (at least once we know for sure) parking illegally. Parking violations happen everyday in this town, all over the place. The UPS truck, the Minute Man Cleaners truck. These guys all do exactly the same thing…trying to do their business and deliver goods quickly, and then moving on. They are not illegal operations. They just violate parking rules sometimes. Annoying? Yes. I think people look the other way when there’s something in it for them. Hey, we like to get our packages, right? And our dry cleaning deliveries, right? But it seems like if there’s nothing in it for the Westporter, then let’s take legal action! I mean, there are plenty of people parked illegally on Compo at all hours of the day…right in the “bike lane”. Probably right now! Maybe the food truck guy deserves to get a parking ticket, but so do UPS, Minute Man and some of my neighbors. But wait, Minute Man Cleaners is a Westport business that pays taxes, and so they should be able to get away with it. No, I don’t think so. You say that you prefer to only support small business that operate legally in Westport, but that might be hard to find with your stringent “no parking violations or you are an illegal operation” policy. A legal business violating a parking regulation results in one offense, but an illegal business violating a parking regulation results in two offenses, at least in my world. You are entitled to your own form of logic, but it apparently very different from mine. The truck referred to above, the one with the Portuguese woman operating it, that is a legal business with a permit. She may sometimes park on side of road in a way that warrants a parking ticket but the business itself is legal. God help us this thread is still alive?